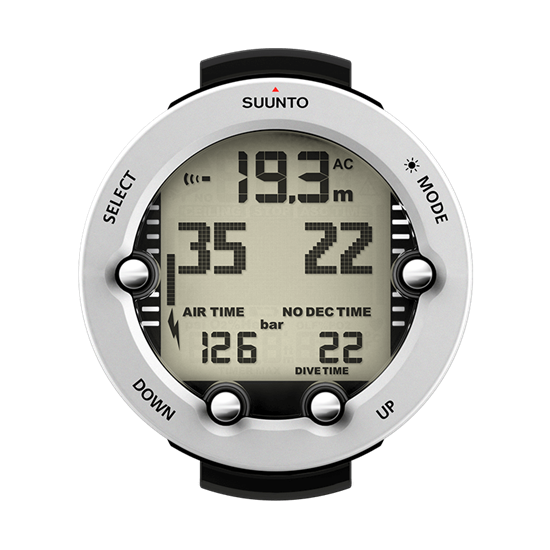 The Suunto Vyper Novo is the next generation of the popular Suunto Vyper line and is a great dive computer for intermediate divers who have graduated from the Suunto Zoop and need more-advanced features. Unlike the original Vyper and the Zoop, the Vyper Novo boasts air integration, 3 gas mixes, and free dive modes, with a display and interface that will be familiar to the many divers that have used either device in the past. Suunto has cleverly designed the Vyper Novo to appeal to less-experienced divers who want to do more, learn more, and try more than they have in the past. They haven’t bogged down the Vyper Novo with too many options and too many features, but have instead created a simple, affordable path for competent divers to expand their skills. Whether a diver wants to stick with no-stop dives and add a reliable compass, or grow as a freediver with an onboard apnea timer, or develop their technical skills with gas switching and nitrox, the Vyper Novo makes it simple. The Suunto Vyper Novo offers a range of advanced dive computer features and capabilities in a streamlined, compact watch. The display is easy to read and the rugged design is durable, and it’s a great mid-level dive computer. Who Is This Dive Computer Designed For? Still Looking For The Right Computer? Check out our list of the top 10 dive computer available on the market today. Below is a video overview of the Suunto Vyer Novo by the guys over at SimplyScuba.com. In the video, you can get a closer look at some of the features and functions of the dive computer. The Vyper Novo is a great computer for freedivers, with an innovative apnea timer that helps train more effective breathing techniques, with adjustable ventilation times, increment times, and number of intervals. Optional air integration and support for up to three transmitters for multi-gas diving allows the Vyper Novo to grow with divers as they sharpen their skills and become more advanced. How Does It Stack Up? Rugged design is ideal for durability, and the display preserves battery life. Too large to wear as a watch. Excellent features. For advanced recreational divers, it may be the only dive computer they will ever need. It doesn't have all the features that tech divers are looking for. The four-button operation is easy to use even with gloves, and operation is simple and intuitive. Some people find it a bit too expensive, but the mid-range price is perfect for advanced beginners and the Vyper Novo has all the features many divers will ever really need. View Product on Recommended Retailers Site.. The Vyper Novo is a great next chapter for the original Vyper and a natural progression from the Suunto Zoop. The Zoop is a popular and widespread beginning dive computer, and the Vyper Novo builds on the existing functionality and interface, adding more features in a logical progression. As some people have noticed, not only does this make the Vyper Novo easy for them to use and learn, but it also means that chances are very good that anyone in the dive shop or scuba class can easily figure out how to use the Vyper Novo. It’s definitely a wrist dive computer and is too large and bulky to wear regularly as a watch. The Vyper Novo is the ideal dive computer for divers who started with the Suunto Zoop and want to add more features within the familiar interface. It offers more advanced capabilities at a price point that is also perfect for more experienced recreational divers who want to explore technical diving or freediving without spending a fortune on gear. It should last for about 18 months or 150 dives. What type of batteries does it use? Is it Compatible With The Suunto LED transmitter? The Suunto Vyper Novo doesn’t offer all of the advanced capabilities of other dive computers aimed at technical divers, but that isn’t who it’s made for. It’s made for divers who want to know more, grow more, and improve their dives without spending a fortune on gear. It’s an excellent mid-capability dive computer for people who have advanced from beginner status but don’t want or need to invest in a highly technical computer. It’s highly recommended for advanced beginners. Scuba diving is a dangerous sport that can result in serious injury or death. Although we go to great lengths to help you become a better scuba diver. The information and advice provided at ScubaDiverHQ.com should not be substituted for proper dive training. We Highly recommend obtaining your diving certification from an accredited dive organization before you attempt to participate in any scuba diving activities. ScubaDiverHQ.com is a participant in the Amazon Services LLC Associates Program, an affiliate advertising program designed to provide a means for sites to earn advertising fees by advertising and linking to Amazon.com. Copyright © 2018 by ScubaDiverHQ.com.